For the next two weeks, The Chester County Hospital is exhibiting “Medical History Reimagined” by artist and chronic pain survivor Sarah Bigham. Sarah used her experience as a patient with chronic pain to create this series of compelling images that utilize her actual medications as an artistic paint medium. 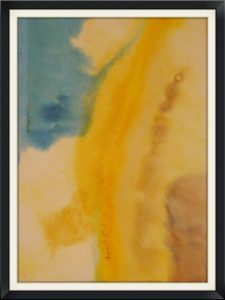 The medications and supplements that she has taken were dissolved into water and painted on paper. The use of color washes amidst the stronger paint strokes contain her journey’s narrative. Sarah’s expressive strokes of color convey her emotions, powerful, and also uplifting. One of Sarah Bigham’s works. One of the great tragedies of chronic pain is that it is not visible to other people, and if it is not visible, it is hard for people to understand what the patient is going through. 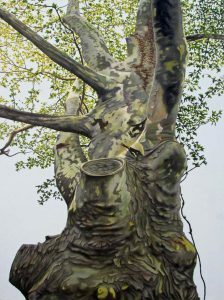 Her exhibition is in the main Chester County Hospital campus, at 795 East Marshall Street in West Chester. 30% of all painting sales are donated to the American Chronic Pain Association and Interstitial Cystitis Association. The exhibition will move on to Galer Estate Winery in August, and hopefully other locations as well. This is a beautiful series of paintings in its own right, but also a very compelling, unique way to express a patient’s journey through suffering to healing. The works of Victoria McNeil Le Vine will be on display at Grace Winery. 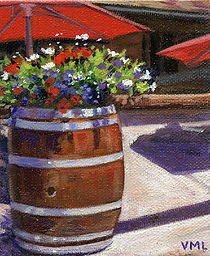 In winery tasting rooms along the Brandywine Artisan Wine Trail, many artists are exhibiting their paintings. At Grace Winery in Glen Mills, Katee Boyle and Victoria McNeil Le Vine are exhibiting their paintings. Victoria is an artist and former graphic designer who paints primarily landscape work, but also does floral still life pieces and miniatures, in oil and watercolor. Vicki and her husband also own and operate The Inn at Grace Winery in Glen Mills, Pa., the recently renamed Sweetwater Farm Bed and Breakfast. Artist Katee Boyle is a Chester County abstract painter and metal sculptor who creates intuitively, drawing from experience, surroundings, and dreams. She works in series, as a “visual storyteller”, and shows regularly in Chester County. Wilson Vineyard in Oxford has their own art gallery, managed by artist Sally Wilson. Currently 22 local artists are exhibiting their paintings, sculpture and jewelry at the Wilson Gallery. Photographer Daphne Longo-Okcuoglu is exhibiting her images at both Kreutz Creek Winery locations in West Grove and downtown West Chester. Daphne’s beautiful photographs include family scenes as well as images that capture Chester County’s natural beauty. This Friday, May 27 3-7pm, acclaimed painter Frank DePietro shows beautiful paintings of Chester County hillsides and treescapes at Galer Estate Winery in Kennett Square. Next Friday is “First Friday” in towns throughout Chester County, with new artist show openings and art events all weekend!